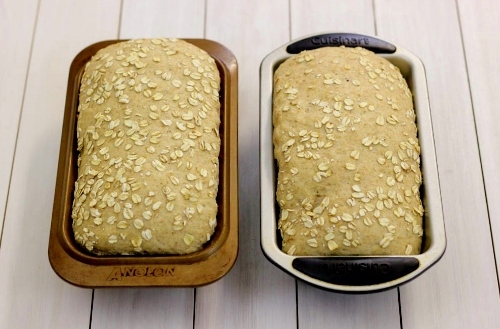 Homemade bread can seem like an intimidating task, but it really is a simple homemaking skill. 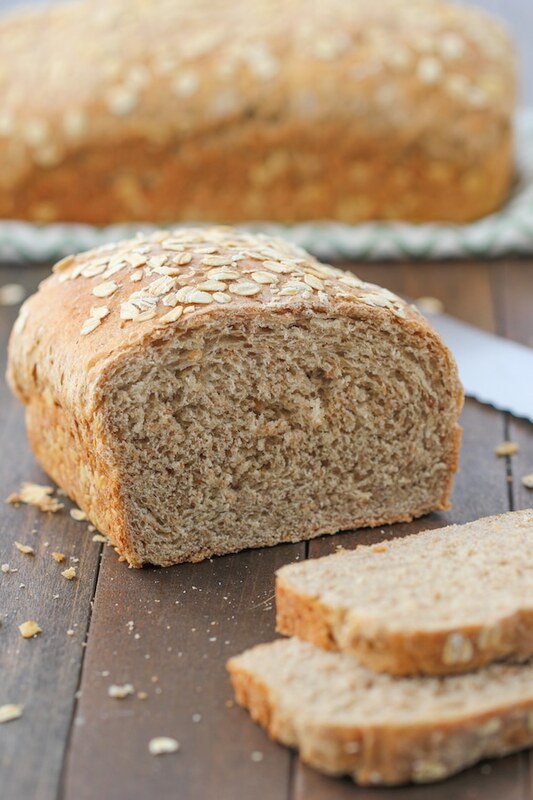 This multigrain bread has so many different grains and two different flours, honey and butter, so the it has extra flavor and texture. The process is quite simple and results in a tender loaf, not dense at all. If you have a standing mixer, there’s hardly any work involved at all. 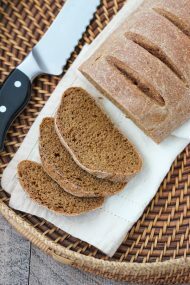 I have my standard recipes for regular white bread, and I love them, but I also wanted to find a good recipe for a whole wheat, multigrain bread as well. The problem with most whole wheat recipes is that the bread is so dense and hard, and that’s not what I was going for. I also didn’t want to be perusing many aisles in several specialty stores looking for all the different grains that the recipe would need. 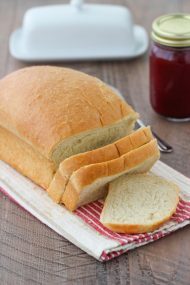 As soon as I gave this recipe from American’s Test Kitchen a try, my husband and I were both very pleased with the results and I’ve been making it for several years now.It’s so rewarding to take out a warm and fragrant loaf of bread from the oven, and the smell that wafts throughout the house is amazing. I wish I could have my house smell like that all the time. This multigrain hot cereal mix is the perfect answer to multigrain bread. You can use this 5 grain mix that I found at a regular local grocery store, or look for 7-grain mix by Bob’s Red Mill or Arrowhead Mills. 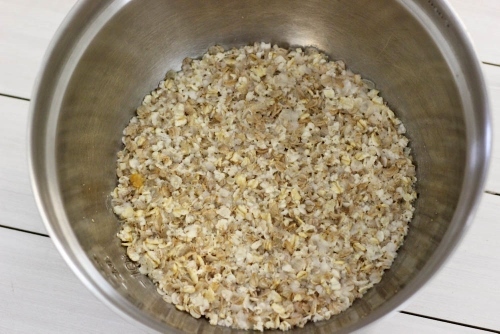 Instead of gathering many different grains and dealing with them all separately, the hot mix cereal gives us a simple solution. Here we have numerous grains and we only have to deal with them once. Isn’t it genius? Pour the boiling water over the cereal mix and set aside for about an hour, until it cools to approximately 100 degrees Fahrenheit. During that time, the cereal will hydrate and soften, soaking in all that water. 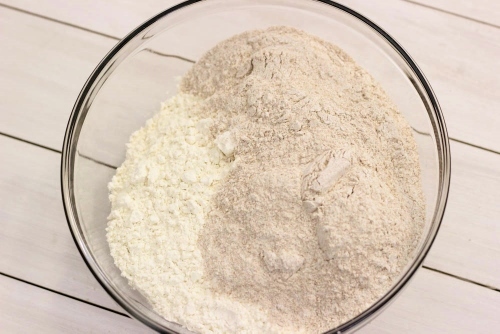 In another large bowl, combine the two flours together. Using half the amount of whole wheat as all purpose flour, will keep the bread nice and soft. 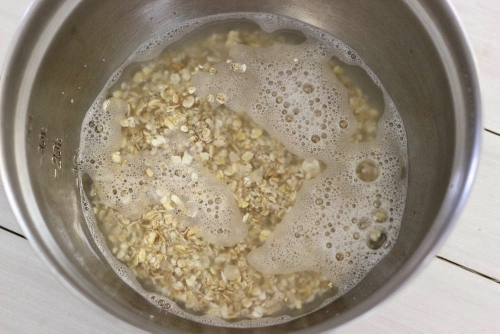 Once the cereal has cooled, add the honey, melted butter and yeast. Mix to combine. In a standing mixer with a dough hook attachment, mix the dough on low speed, slowly adding in the mixed flours. Mix for about 2 minutes, until the dough forms a ball. Cover the bowl with plastic wrap and set it aside to rest for 20 minutes. 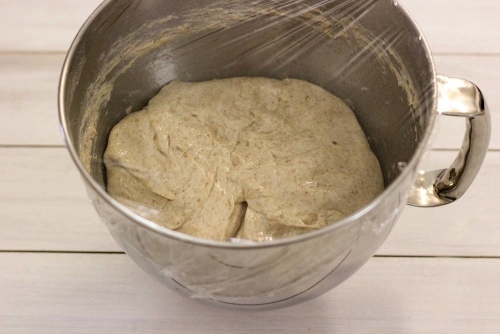 Resting bread dough for 20 minutes is a very important step. 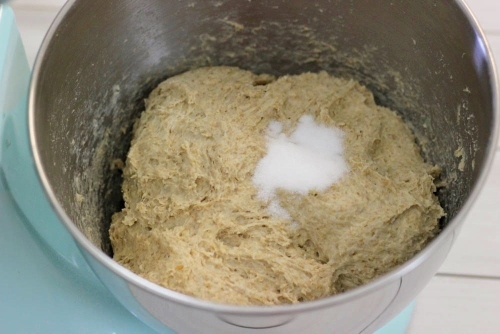 As the bread rests, the flour protein begins to break down and becomes much easier to mix. We have not added salt yet, and it’s also important to note that leaving the salt out until after the short rest period will make gluten development quicker. 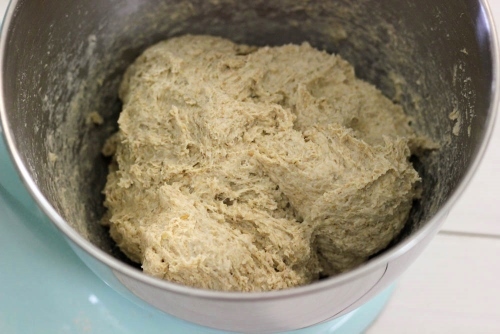 Unsalted bread dough that rests for just a short amount of time will be pliant and smooth, while salted bread dough that doesn’t get a 20 minute resting period will still be gluey and stiff. Add the salt and mix knead the bread dough for about 7 minutes, until the dough has pulled away from the sides of the bowl. If you’ve mixed if for 3-5 minutes and it’s still sticking to the bowl, add 3 Tablespoons more flour. Preheat the oven to 375 degrees Fahrenheit. Grease 2 bread pans with oil. When the dough has doubled in size, cut the dough in half. 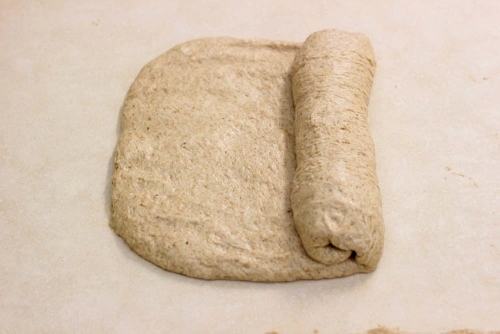 Flatten each half of dough into a rectangle and then tightly roll the rectangle into a loaf. Why? 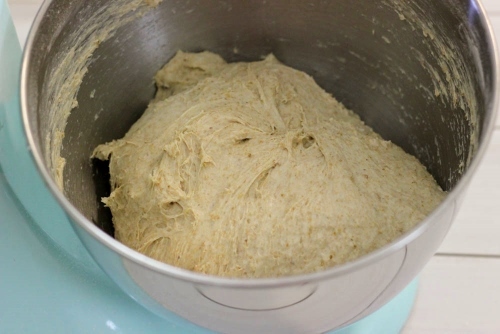 This will help the bread have an even texture, help it rise better and result in a nicer looking loaf of bread. Bake for 35-40 minutes in the preheated oven. Cool the bread in the loaf pans for about 5 minutes before taking them out of the loaf pans and onto a cooling rack. If you have a small family, you can freeze the second loaf. Wrap it securely and freeze and then simply thaw and serve when you need more bread. It will stay fresh perfectly. Another option is to share the second loaf with your friends or someone in need. I’m sure your thoughtfulness will be appreciated. Who wouldn’t love a fresh loaf of homemade bread? 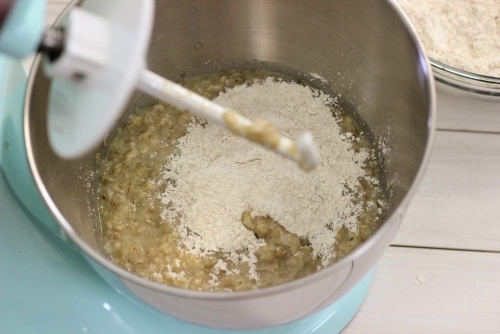 In another large bowl, combine the two flours together. In a standing mixer with a dough hook attachment, mix the dough on low speed, slowly adding in the mixed flours. Mix for about 2 minutes, until the dough forms a ball. Cover the bowl with plastic wrap and set it aside to rest for 20 minutes. Add the salt and mix knead the bread dough for about 7 minutes, until the dough has pulled away from the sides of the bowl. If you've mixed if for 3-5 minutes and it's still sticking to the bowl, add 3 Tablespoons more flour. When the dough has doubled in size, cut the dough in half. 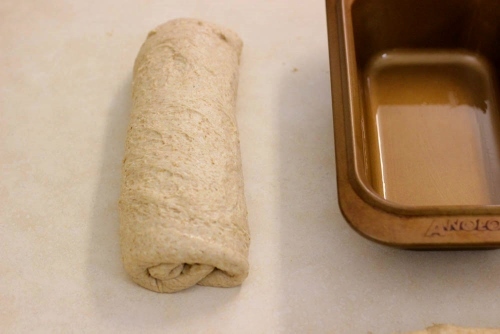 Flatten each half of dough into a rectangle and then tightly roll the rectangle into a loaf. 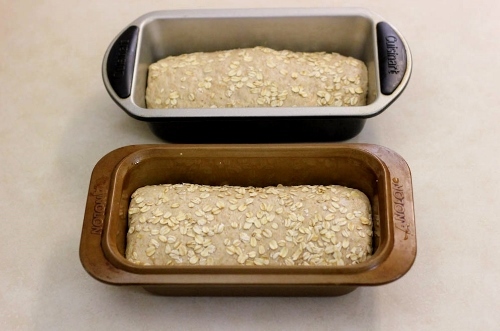 Lightly spritz each loaf with water or oil and roll in the oats, just enough for the oats to adhere to the bread. Place into the loaf pans and set aside to rise until double in size, for another 40 minutes or so. Bake for 35-40 minutes in the preheated oven. Cool the bread in the loaf pans for about 5 minutes before taking them out of the loaf pans and onto a cooling rack. 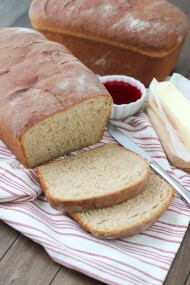 My husband and I love multigrain bread! I will be baking this bread for sure! Thank you, Olya! Will be making this next week after I buy the multi grain hot cereal. THANK YOU once again for another great recipe. You’re welcome, Oksana. I’d love to hear what you think once you try it. Absolutely agree, Alena! I’m also very conscious about feeding my family healthy meals. It’s SO important. Just wondering how’s the bread texture? Is it soft? 🙂 I really love your step by step photos by the way! So helpful! Yes, as I mentioned in the blog post, the bread is soft. I’m glad you find the photos helpful. Thank you for such great recipe! I have been living in the kitchen since discovering your blog. You are very talented young lady! Thanks, Julia. How kind of you to say so. Enjoy cooking. Olga, can I use a hand mixer for this dough? I don’t have a standing mixer:( Thank you! No, Aleksandra, a hand mixer just doesn’t have enough power to mix bread dough properly. You can certainly knead the bread by hand though. Thank you, Olga, for sharing this recipe. I just bake couple of loafs tonight and really like it. May God bless you and your wonderful family!!! Thank you, Yelena. God bless you too. Olga, I made this twice already. I follow your recipe, but the dough is extremely sticky and won’t rise much for me after I put it in the loaf pans. Your bread looks higher than how mine came out. Any suggestions? Hi Alena! 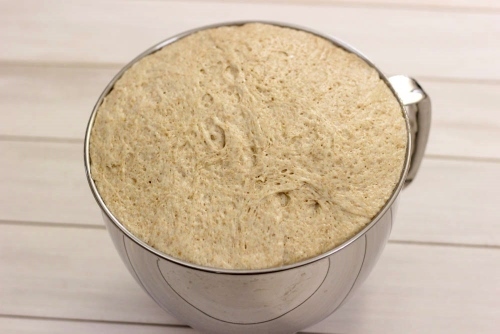 You can add a few Tablespoons of flour to the bread dough if it’s still sticking to the sides of the bowl. Also, did you let it rise long enough? Was your room warm enough? I’m so happy to hear that, Farzana. I’m thrilled that the recipe is helpful. Enjoy the bread:). Would I be able to substitute old fashioned oats? Would you also be able to post a good 100% whole grain bread recipe? No, Yana, old fashioned oats will not work, at least in my opinion. You can give it a try if you’d like. ALL i HAVE is Bleached white and also whole wheat flour can I use this instead?? Do you have the multigrain cereal? You can use those flours that you mentioned, but I wouldn’t skip the cereal, Mel. I finally have a kitchen large enough for me to bake. My loafs are now in the final 40 minutes of rising within the loaf pan. I am experimenting by leaving one loaf on a pizza stone. If it does not work out, I hope i have success with the one in the loaf pan. I could not find any 5 or 7 grain cereals, only oats. I mixed in some wheat bran, wheat germ and rolled oats. The rest of the recipe is as you shared. In approximately 2 hrs I will be able to tell you how it turned out. That’s great, Ricky! Glad this recipe caught your eye:). Since my first post I baked several loaves. 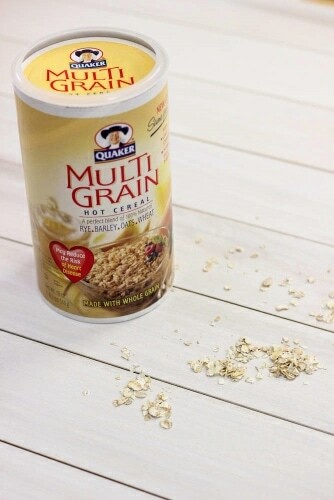 I found multi grain cereal at Amazon.com, non found locally. Loaf pan works better, the pizza stone loaf was too flat. Thanks for taking the time to let me know, Ricky! We love this bread in our family. Hi Olga, Can you tell me what size pans you use for this recipe? That’s great, Daniel! Way to go! I LOVE this recipe! Made it today and it is such a nice consistency but the rolled oats fell off as I sliced the bread. I sprayed it with olive oil and then rolled it in the oats…any advice? I ran across your blog the other day and thought this recipe looked great! I have since tried to make it twice, both times my bread simply would not rise for me after I formed the loaf. I have made wheat bread for years and have not had this problem. During both of the rises I rest the bowl/loaf pans in warm water to aid in the raising process. For this recipe I did the same thing, to no avail. I waited for two hours for the last rise until I grew to frustrated and finally threw it into the oven. Ended up with flat, fairly dense loaves. 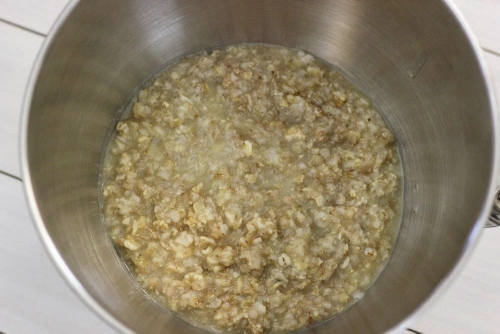 I followed the recipe exactly with the one addition that I used a 10 grain hot cereal instead of a 5-7 grain. Do you have any thoughts on what could have gone wrong? I’m sorry, Kristen, but I just don’t know what to tell you. I tried to be very clear and precise in the recipe instructions. Is your yeast fresh? Try putting some in warm water and let it stand for 5 minutes, it should become foamy. Maybe your kitchen isn’t warm enough? The yeast is fresh, I just used it the other day. And I put the dough bowl in a sink filled with hot water for the sole purpose of ensuring that it is warm enough for the yeast to grow. I have read that using vital wheat gluten can help with rising issues. Do you think that may be my problem? Multigrain bread is the favorite bread of my family. We all love bread and can make a meal out of it. Love this easy recipe will be trying it very soon. Thanks Awesome!!!!! I hope you like it, Yvonne:). I made this recipe today. It turned out amazing! I bought a small bag of unbleached all-purpose flour at the store today thinking I had whole-wheat at home. Annnd I ended up with two bags of unbleached all-purpose. And I couldn’t find the 5 or 7-grain hot cereal at the commissary. So I made the following substitutions: Hodgson Mill Oat Bran hot cereal with some oats mixed in, and I used almond flour instead of the whole-wheat plus some ground flax seed. I can’t stop eating it! I’m glad you enjoyed the bread, Rachael. Hi, Olga. I just made the bread following your very clear directions and step-by-step photos…and the two loaves turned out great. I didn’t have wholewheat flour, so I substituted with plain bread flour. As for the multi-grain cereal, I happened to have leftover 5-grain porridge mix and that worked perfectly. It’s a brilliant idea to use cereal mixes like this. I just found your blog today and plan to return to enjoy your recipes and postings. Keep up the good work. PS I have never bothered to leave comments in blogs I have visited todate. But I am so happy with your recipe and presentation, I just had to leave my thanks. Hi MM Saw! Welcome. I am so glad you stopped by and are happy with how the bread turned out:). Thanks for taking the time to write. It means a lot to me. I hope you find many other recipes that your family will enjoy. I put the dough into the baking pans and let it rise again. After they got volume again, I put them into the preheated oven and right there in few minutes the top of the bread flattens down! I made even this bread with your recipe and the same thing happened on them. What do you think the problem might be? Maybe I need to add more flour? or less yeast?! I made it this morning but made a few alterations. I used hot milk instead of water, a bit more honey, and split the amount of flour evenly between whole wheat and white. It turned out lovely. It had a nice texture and was soft. That’s great, Suzie! I just love this bread. I’m so glad you enjoyed it too. Will this recipe work in a bread maker? Probably, but you will have to adjust it to your machine, Linda. Olgak7, I live in Australia and we use metric measurements. Can you give me some idea of weights please as our cups are 250 mils.? Thanks, look delicious and I love multi-grain bread. Never mind Olga, made another 2 loaves today and they where flops as well. Four dead loaves of bread, I think this bread is not for me. Have been making bread for many years and have had an occasional flop, but never 4 in two days. Loaves look great, rise well, after 20 minutes in the oven down they come. When I cut them the centre is doughy. Have just discovered 7 grain hot cereal and thought it might be easier than adding individual grain but at least they turn out. Love your site and will try your chicken noodle soup next. I’m sorry to hear that this bread didn’t work out for you, Jeanette. I wouldn’t have been able to tell you metric measurements for the recipe, since I just use the standard American cup measurements. Thanks Olgak9. Can you tell me the volume of your cup please, in ounces and fluid ounces if these what you use. I can hopefully work it from there. I just made this bread today and it is delicious and will definitely be a staple at our house. I was just wondering if you happen to know the flour measurements by weight so I can be sure that I am using the exact same amount as you are. Mine turned out great but I felt like I could’ve used a little too much flour. I’m so glad to hear that you enjoyed the bread, Christopher. It’s definitely one of my favorites. Followed your recipe closely, pictures were a great help. I made 2 amazing multigrain bread loafs. I finished both lofts as my kids were walking through the door after school. The house smelt great! I was so proud of my self that I cut a few slices off one of the loaf and gave them to my neighbors! I’m so glad that the pictures were helpful, Dianhann. The smell of homemade bread is amazing. Best aromatherapy:). I just found your site and made this bread, it turned out absolutely wonderful and I play on making it again. The only issue I had is that it is so soft that it was hard to have formed slices. How do I make it more dense? That’s great, Anna! So glad you enjoyed it. If you want the bread to be harder, try adding a bit more flour. I have made this recipe now probably 5 times. I am addicted to this awesome bread. So tasty and very easy to make. It has never failed. Thank you for your recipe !!!! Many loaves since my first one. I still use your recipe. I always follow your very clear instructions. Over time the bread comes out better than when I first tried. I don’t know what I do to change things. I use 100 degree water in s small bowl to activate the yeast. I set the loaf pans covered by dish towels on the stove above the oven to rise. Maybe I have become more careful about how I place the loaf pans in the oven after the rise. I try not to jar the pans or slam the oven door. I try to use a very smooth and quiet process in order to prevent any disturbance to the delicate dough. Whatever the reason is, the bread gets better with practice. I love it and can’t get enough. Can I use 2 1/2 cups of unbleached flour and 2 cups of whole wheat flour? Also, can I make a 1 1/4 cup multi grain cereal mix that contains other seeds. Would it change the texture of the bread? I’m not sure, Denise. I only made this bread by the recipe that I posted. I can’t be sure of the results to something I never tried. Thank you Olga – the two loaves of bread came out delicious and appreciated and enjoyed by all at home. Came out perfect, the first try. We’ll make this again and again. That’s great, Govi! I’m so glad you enjoyed the bread. Olga, thank you so much for such as great recipe!!! I made this bread, turn out well. The only thing that I concern it is time consuming, however, very good and delicious . Love your blog and enjoy all your recipes! I made this today but instead of all purpose flour, I actually used 100% whole wheat flour and added 1 Tbl of vital wheat gluten per cup. It came out just like the soft, chewy, sandwich bread you typically buy at the store. Thanks so much for the recipe! That’s great! Thanks for taking the time to write, Melissa. This was a great recipe! I used Red Mill 10 grain cereal as I could not find the 5 or 7 grain cereal. I also added about 1/8 cup of unsalted sunflower seeds. It is an amazing bread. Thank you for the recipe. I promised my husband I will be making this again! Bob’s Red Mill cereals are great; I love using them. This is one of our favorite breads to make. I’m so glad you enjoyed it too, Tina. I’m so happy to hear that, Maria. Thank you for taking the time to write. I have been baking your recipe for many years now. I no longer live in Washington. The locals here in Texas grow rosemary to keep mosquitos away. 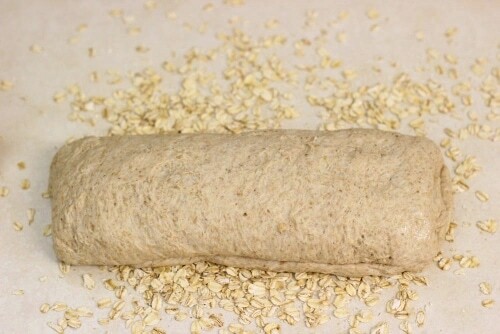 I tried using fresh rosemary and wheat germ along with the rolled oats and the flavor is just awesome. I also substituted the 1 1/4 cup whole wheat flour for 1 cup wheat germ. I used only 1 cup 7 grain cereal. All the rest is just as you stated in your multigrain bread recipe. The wheat germ gives the bread a nutty flavor and the rosemary gives a fresh new aroma reminiscent of Christmas. I still love your recipe just as it is, but this little experiment came out so good I had to share it with you. Thank you for your great flavors and your nursing. Only a fellow nurse knows how truly hard and thankless that job is. 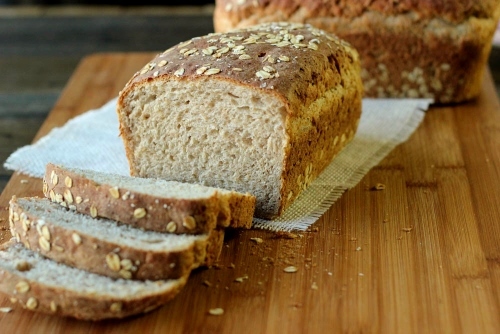 This is the absolute best recipe for whole grain bread. I have been making it for several years and everyone LOVES it. It is worth the wait for the 3 hour prep time. The informative instructions explains the science behind the makings of this very delicious bread. Thank you for sharing this recipe…it is so good, second to none. I have been making this bread for several years. 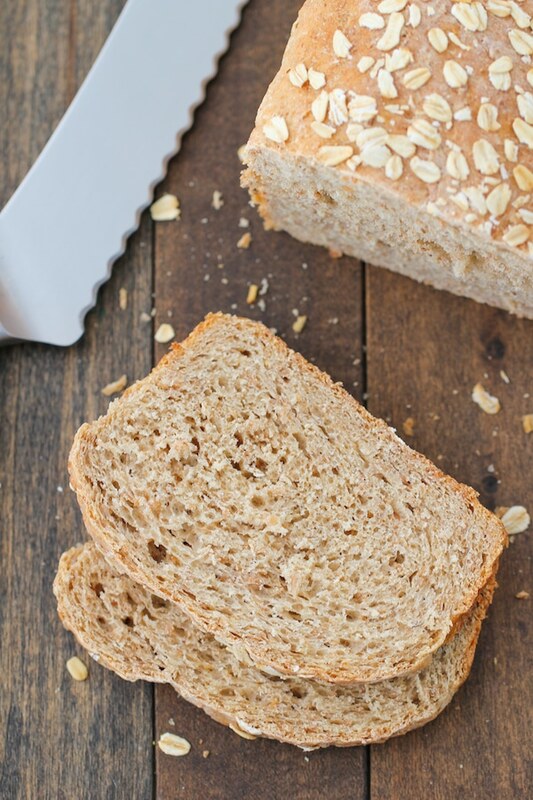 This is the best whole grain bread recipe. Everybody LOVES it. The instructions are informative and really explain the science behind the making of this delicious bread. It is well worth the 3 hour prep time. This is the best recipe….second to none..thank you for sharing. I’m happily making this presently. Glad I decided on this game plan because I wanted a generous amount of whole grain in the product, and your recipe has that and you can still make it as light as suggested or even heartier-heavier, depending on your wish. Even changing up the suggested proportions of flours and not having any commercial multi-grain-cereal mix, the dough is just delicious. I used grains I had on hand: 1/4 cup each of oat bran, yellow millet, fine Turkish bulgar wheat, roasted buckwheat groats, and granulated barley. I used 2 cups of hard red whole wheat flour, 1 cup of sprouted spelt flour, and 1-1/2 cups of white bread flour. Since I had raw honey, it only took 3 tablespoons of the honey measure to make it pleasantly sweet. Did I say delicious dough?! Made it by hand and it still came together easily with this delay adding the salt. Can’t wait to enjoy this bread used in another recipe for Thanksgiving ! Thank You! I make a similar recipe. Tried this one and I had to add a lot more than 3 additional tablespoons of flour, the dough was very wet and sticky. I followed the directions to the letter, not sure why it was so wet. I have been baking bread for many years and this is my favorite recipe. I love the taste of the grains plus it’s just a little sweet from the honey. Just a couple of things to remember as you are putting this together. 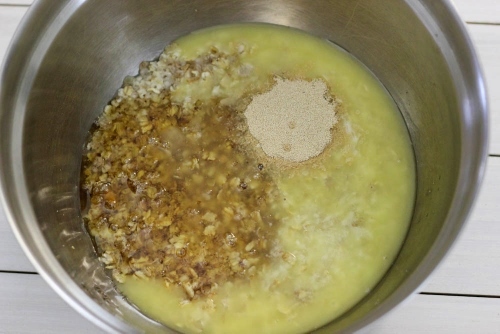 Once you mix the flour with the grain/honey/butter/yeast mix it will seem very dry. Just let it do its work for 20 minutes and start kneading. There is petty of moisture once everything gets mixed together. The second thing I learned is that the loaves don’t rise much once they have been shaped and put into the loaf pans. Don’t worry, they will spring very nicely once you start baking them. I preheat the oven with a pizza stone. I put them in the oven with two cups of ice cubes in a pan in the bottom of the oven to create steam. The loaves spring nicely! Thanks for the great recipe. This bread tastes amazing!! I’m so glad that you enjoy this bread recipe, Mark. Thank you for sharing your experience. This is a really nice recipe and worked beautifully for me. I used white wholewheat flour but found that I needed almost 3 cups of water to get a moderately wet dough. I tried using the mixer with a dough hook but it wouldn’t combine so eventually just mixed and kneaded by hand. One point, you don’t mention what size loaf pans should be used. I took a guess and used the 8.5″ x 4.5″ pans rather than the 9 x 5 and it appears that was correct. I’t an important point that you missed. Other than that, thanks for your detailed recipe with pictures. This is the recipe from America’s Test Kitchen, minus the sunflower seeds. You should credit or reference them. I’m making their recipe now and was cross referencing it for result information. Yes, I got this recipe from America’s Test Kitchen, but I did give them credit. In the 2nd paragraph where I was describing the recipe, I wrote that I got the recipe from there, with a link to their website. This recipe is amazing! I bake it at least twice a week. 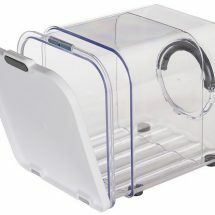 My kids love it and it also makes a great gift. Love the simplicity! I’m so glad you enjoy the bread, Lindsay. That’s so awesome that your children love it too. Thank you so much for taking the time to write. Thank you Olya,for a very good recipe!Made it 2 times with great results. I mixed the dough in a breadmaker and used only 2 tbs of honey and 2 teaspoons of yeast. Bread turned out really fluffy and delicious! I’m so glad you enjoyed the Multigrain Bread:). Thanks for taking the time to write. Hi Olga, I went through the comments but I didn’t see anyone mention if this recipe can be halved? I only have one bread pan but still want to give this recipe a try. Also because I am staying away from dairy I plan to use olive oil instead of butter. Have been reading online and a good substitute is 3/4 tbs olive oil to 1 tbs butter so I will try that. I think you can halve it, Elvira. This is the most amazing bread, I have made it numerous times and it always turns out perfect. I used to make it for my dad, who has recently passed away. He always and only requested this recipe, so I now think of it as ‘dad’s bread’. I just want to thank you for a recipe I will hold onto forever. I’m so happy that you and your Dad enjoyed this bread and I’m so touched that you have such a sweet memory of the bread with your Dad. Blessings to you, Sam.